High quality and inspirational teaching are at the heart of my philosophy. I have recently graduated as a mature student studying Trombone at Birmingham Conservatoire and have played Trombone at the highest level in the brass band movement. I also have wide experience of orchestral and theatre work. I currently play principal Trombone with AW Parker Drybrook Band and I am also musical director with Malvern Hills District Brass Band and Worcester Concert Brass. I have also composed and arranged music for brass band, brass ensembles and other wind groups. I have worked as a low brass specialist at the Elgar School of Music since 2012 but teach all brass instruments from beginner to advanced and at any age including post retirement. I also teach priivately through my own West Midlands Brass Academy which also includes some brass chamber groups. I also have an excellent exam record including two recent distinctions at grade 7 and grade 8 for Trombonists. 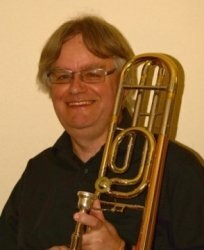 I enjoy teaching all brass instruments at any age or level but teaching to an advanced level on any instrument requires specialist skills and knowledge, and the tuition I have received from some great Trombone teachers and brass technicians have given me those skills which are all to often not available to advanced students. I believe that at whatever level a student is the most important thing is for them to enjoy their experience and so I always try to inspire my students to exceed their expectations. I always try to teach using music that they like to play, and will always involve them and their parents - where appropriate - in the choice of exam music so that they have a proper stake in their own future. Although exams are a good measure of progress the choice of whether to enter a student will always be one for that student in conjunction with the parents and the tutor, but it is not an appropriate route for everyone and some students may require a different strategy to achieve their goals.